Tholi Prema Movie Review: The Tollywood Director Venky Atluri’s Telugu movie Tholi Prema featuring Varun Tej and Actress Raashi Khanna in the lead roles, The film is all produced by BVSN Prasad under the banner Sri Venkateswara Cine Chitra. Tholi Prema Movie 2018 received positive reviews and good ratings from the audiences. The Tholi Prema film has received a U/A certificate from the censor board and has a runtime of 2 hours and 13 minutes. 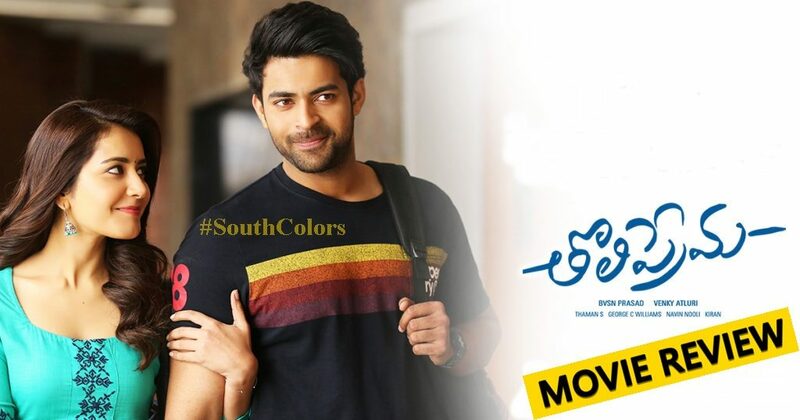 Tholi Prema is a cute little a love story weaved between Aditya (Varun tej) and Varsha (Raashi Khanna) in different phases of their life.Thier Love track in Intermediate college, an engineering college and at workplace showcases their bonding and misunderstandings. How these different phase emotions presented on screen are to be watched out on screen. Tholi Prema stands up to its title with its cool n emotional execution. At places, the narration went slow and routine, but the dialogues hold each scene very tightly. yet the narration has gone completely in a different way. Varun Tej as Aditya gave a good performance. He looked hefty in few scenes. Maybe a much leaner Raashi made him looked so? He looked uber cool, shown maturity in emotional scenes. Actress Raashi Khanna is the show stealer. She looked fresh n beautiful in each scene. Her lovely presence as a teenage girl in introduction scene is adorable. She excelled in both as a cute college girl and matured working woman. Performances: Mega Price Varun Tej has done a good job and his performance is the highlight of Tholi Prema. Actress Rashi Khanna has delivered good performance and her glamour and chemistry with the hero are among the attractions of the film. Sapna Pabbi, Priyadarshi Pullikonda, Suhasini Maniratnam and Vidyullekha Raman have done justice to their roles, say the audiences. Technical: Tholi Prema Movie has decent production and George C. Williams’ beautiful picturisation, SS Thaman’s songs and background score and Navin Nooli’s Editing could have been better in the second half. Verdict: On Final Note, Tholi Prema could reach the right audience for its youthful content. A little more entertainment would have worked wonders for this movie. But routine second half killed the magic.Still., watch it for Raashi’s cute outing and lead pair’s awesome chemistry. Overall, it is a decent watch for youth and families.